I appreciate the thought behind this article but I have to admit, I am getting tired of people writing about how we need to *start* all these things. Just because they may not be in common practice in all schools does not mean they are not happening. I am exhausted by the number of times I have had someone new come into my school with the next ‘great idea’ without asking what we were already doing. It’s uncomfortable to explain to someone who is preaching about how all you need to do is adopt their nifty new ‘thing’ and then you’ll be all set, that you already DO what they want you to try. It has been a few years of people coming around and ‘teaching’ me about the power of everything from instructional strategies to reading skills, content vocabulary, reading and writing in context, and even little things like passing out gum and mints during testing. I have a great deal of respect for most educators (I’m just being careful because there is always a rotten apple and I don’t want to have those arguments here about ‘you don’t know Miss So and So, she was awful!’ because I believe that the majority of children and parents know when they have gotten that teacher just like their coworkers do and some day I’ll write that post) and I willingly listen to their ideas, but at this point everyone and their Great Aunt Fanny has advice for me. What is starting to get a little frustrating is the fact that every time a new person walks in and starts the ‘gee whiz, if you knew what I knew, by golly you’d be on board today!’ spiel it means sitting through another pep talk/speech/sales presentation and spending more of my professional development time on something that isn’t getting us anywhere new or anyplace further along the continuum towards proficiency I have a limited amount of time which is consistently cut short with report cards, paperwork, meetings, paperwork, files, cleaning my classroom, paperwork, and sometimes I have some paperwork to do. What I don’t have is time to ‘geek out’ and read a book, and then discuss it. Incidentally, if there is a school that does that please let me know if you have any positions open, I’d give my eyeteeth to work in a place that sees professional development time as a time to develop *myself* instead of more paperwork. I get it, paperwork is important, but come on, how many times can you file the same forms before you’re just killing trees for the heck of it? My point in addressing this article is that we need to be aware of the level of frustration that many teachers feel when provided with advice like ‘read the book and pick it apart and discuss it’ and similarly simplistic ideas. I do not need help to understand that it is ideal to read, clarify and discuss books in depth before you use them. What I do need help with is finding the time, or in changing how we see professional development as a tool to be used, or in shifting the focus from the ideal to the real so the advice I’m getting is something I can use. It’s time to stop and think about how we set up professional development and the outcomes we are looking for when we design professional development time so we are creating something that increases our effectiveness. 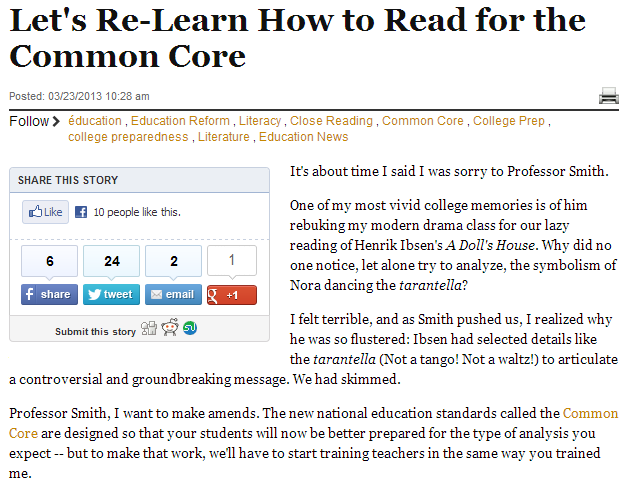 Tags: Common Core, education, education advice, education experts, Huffington Post, instructional strategies, Learning, Professional development, Teacher. Bookmark the permalink. I could not agree more!! There always seems to be something “new” that takes over. Why must we always forget all that we ARE doing and then go from there. As a professional developer through the University of New Hampshire, we are seeing our kind of organic PD becoming less and less feasible in a world where programs rule. The site is actually a walk-through for the dietals you wanted with this and didn’t know exactly who must. View in this article, and also you’ll definitely learn it.